If you passed this church, youd probably not think it was anything remarkable. Youd agree it was rather pretty, with its tiny clerestory, and that the churchyard was trim and well-cared for. Wilby is so small that you probably wouldnt even notice youd come through a village if it wasnt for the church, sitting beside the winding road. Theres nowhere to park outside the church, so if you were in a car, and you missed the spaces outside the school, you would probably just keep going. Alook alone would not show you that the door was open, and that this was a welcoming place. It certainly wouldnt tell you that this little church has one of the finest collections of medieval bench ends in East Anglia. I have written extensively on this site about medieval bench ends, and I dont propose to do so again here. If you are interested, try the entry for Woolpit for starters, and follow the links elsewhere. Medieval bench ends can be found all over Suffolk, but there are particular concentrations, and one of the hotspots is up here in the north of the county. Broadly speaking, Suffolks bench ends can be divided into four groups: images of real and mythical creatures, images of everyday life, images of Saints, and images of the teachings of the church. In general, the Anglican reformers of the 16th century, and the puritan reformers of the 17th, left the first group alone. Bench ends in the second group were only circumspect if they included religious imagery; thus, the lady walking her dog at Ixworth Thorpe survives in all her glory, but figures holding rosaries were often decapitated. Surprisingly, there are a considerable number of surviving bench ends in the third group, most notably at Ufford and Athelington. It is the fourth group that has suffered. Here at Wilby, the bench ends represent the seven sacraments, the seven works of mercy, and the seven deadly sins. Almost all of them are mutilated, just as if someone had wandered up and down the aisles swinging an axe at them; and they probably did. It was nearly ten years since I had last visited Wilby church, back in the days before I had a digital camera, so I thought it was time to make a return visit. It was one of those sunny spring days that seem to wipe out all the miseries of winter. A man was cutting the grass, which I thought a not unpleasant way of spending a sunny Saturday afternoon, as long as I didnt have to do it myself. The graveyard was full of rooks, which was very atmospheric. 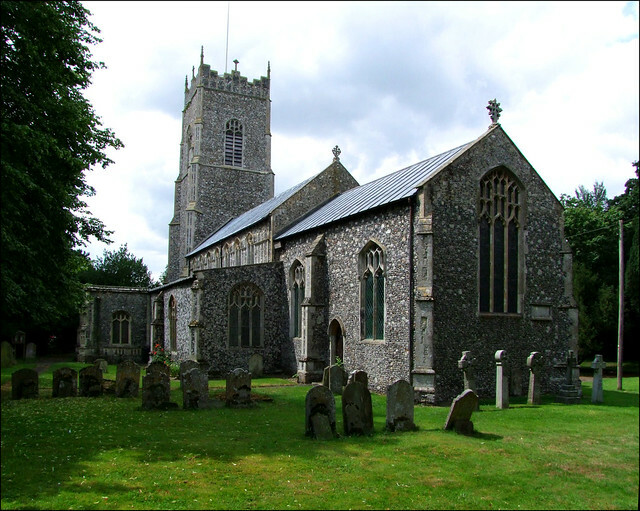 I wandered around the outside of the church, noticing that, although St Mary isn't big, the south porch is one of those grand affairs for which Suffolk is famous. It is lavish in its use of Catholic imagery, denoting a date on the eve of the Reformation. Wingfield symbols are here too. Above it, there is a gorgeous clerestory and a nicely-proportioned tower. The clerestory is not repeated on the north side, and in general it seemed to me that much of the flint-work in the walls was a 19th century restoration. But the general impression is of a well-kept building with evidence of its life down the ages. Inside the church, a lady was preparing flowers on the south aisle altar. There is no north aisle, giving the interior a pleasing asymmetry. To the left of the entrance, at the west end of the aisle, is an extraordinary mausoleum to the Green family, which includes a lovely relief on the north wall. Nearby are lead panels from the roof, bearing churchwardens' initials, as at Kenton. There is a striking St Christopher facing the entrance. Much has been defaced, but you can still see the Saint's house, and the seafood at his feet is delightful. In front of it, the font is intriguing, a mass of 15th century detail, rather more elaborate than most. The figures arond the stem are the best bit. As well as the four evangelists, it includes St Paul, and a figure that Mortlock thought might be St James, in which case it would be a rare survival. The interior is generally Victorianised, in a pleasant, simple manner. There is a Green hatchment, an unidentified brass, and some overlarge union flags. The angels in the aisle are by the Darlings of Eyke, rather more intricate than their single angel at Bromeswell. There is a scattering of medieval glass in the tracery of the north side. There are angels and eagles, Saint Catherine and Saint Osyth, as well as other Saints. That it should have survived at all is worth remarking on. William Dowsing came this way on the 4th of April 1644, and he was in a bad mood. So much so, that the entry in his journal is rather confused. Superstitious pictures, he writes; 30 we brake down; and gave order to take 10 more; and the steps to be levelled; and the whip, and pincers, and nayles, that was at Christ's crucifying; and the Trinity, all in stone. Pictures means images in stained glass. Probably, the thirty were within reach of the churchwardens' ladder, but ten weren't, so were marked down for another day. It would be nice to think that the churchwardens ignored him, and these were the ones that survived, but there's no reason to think that they weren't as supportive to the puritan project here as they were almost everywhere else in Suffolk. The chancel steps had been raised up under the orders of Archbishop Laud within the last fifteen years, and their levelling is a familiar part of Dowsing's work. The instruments of the Passion and the symbol of the Trinity are a bit of a problem, however. Usually, we expect to find them on the font, but there is nowhere that they could have been. On the porch is another possibility, but again it is hard to see where they could have been, and a Marian monogram on the porch has survived, which surely would have been noticed if the iconoclasts had set about it. Perhaps the reflinting of the external walls in recent years is a clue, but it remains a mystery. Dowsing arrived here fairly early that morning - it was a Thursday, and he had spent the previous day in a leisurely manner, visiting just four adjacent parishes, including neighbouring Brundish. This suggests, of course, that he was staying locally, and perhaps had other personal business to pursue. There was a Dowsing home in nearby Laxfield; but we know that he also owned land in the Parishes of Wilby and Brundish, so there is the intriguing possibility that he actually spent the night here. This day, he would also visit Stradbroke and Linstead Parva - but that was all. On the Friday, he'd still be around for Linstead Magna, so the evidence is pretty strong that he was doing something else locally. Perhaps he was also collecting rent on his Wilby and Brundish smallholdings. I wonder what he made of the bench ends. They are in three ranges. Those against the north wall are medieval, and include the seven sacraments, St John the Baptist and St Barbara. In the south aisle they are also medieval, and include the seven works of mercy and the seven deadly sins. The central block and those in the chancel are 19th century. The medieval Wilby bench ends are part of a wider group; the ones at Tannington and Bedingfield are almost certainly by the same artist. They are of a high quality, so it might not have been the work of a local; perhaps they were all part of a group commission, or perhaps they were even once all in the same church. All three of these churches are a pleasure to visit, not least because they are all open to visitors during the day. Wilby is particularly fun, because during the 19th century somebody had a go at reproducing the medieval bench ends as if they had never been mutilated. I wondered if this might have been the Darlings as well, which would make them slightly later, but they are quite different in quality to their work at Eyke. These are the benches that now fill the middle range, and it is interesting and instructive to compare the modern copies with the medieval originals. The 19th century bench ends also include some mythical beasts, which my nine year old son liked best of all. This is a lovely church; fascinating and well-kept without being a museum or a Sunday club; even more interesting than the nearby better-known Fressingfield, I think. I commend it to your attention.